Christians are redeemed by accepting that Christ died for their sins and inviting him to be Lord of their life. What joy this act brings us. Joy, not just that we will be with Christ after our death; but equal joy that he is with us now. Could you or would you want to even try to live in this world without Christ? About a 100 times a day, I pray “Oh, God, help me” or “Need some help here, Christ” or simply “Christ.” When I send these e-mails to God, I’m not being flip or disrespectful; instead, I am making a short-hand prayer. I think that I can safely use these short email prayers, because I spend more concentrated time to be with Him in my devotions at some point during the day. 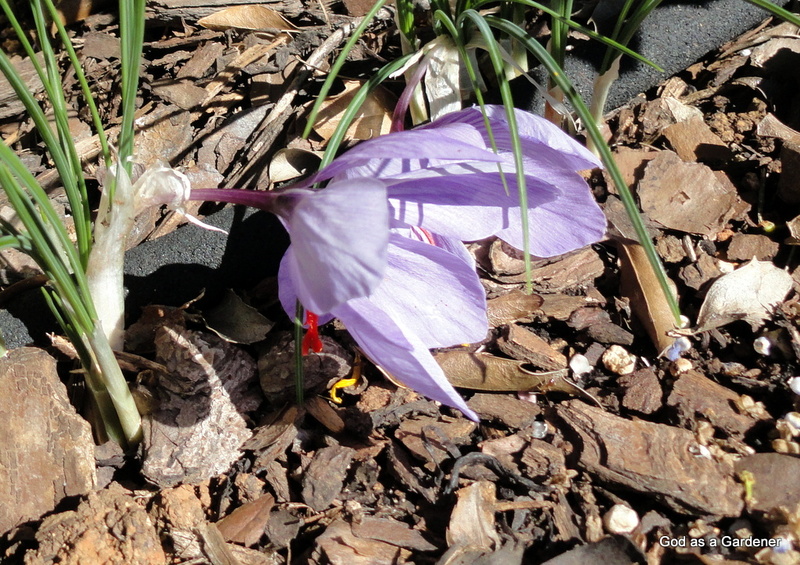 Reflection: Do you burst forth like a crocus after the winter snow? Do you take joy in your redemption? This entry was posted in Plants & the Southern Kingdom - Judah, Uncategorized and tagged Bible Garden, Bible Plants, crocus, God, God as a Gardener, Isaiah, joy, rejoice, saffron. Bookmark the permalink. Absolutely! Without Christ, a Christian would have no purpose!